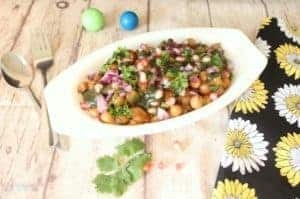 I have posted three chole recipes – one the south Indian style, the second one is no onion no garlic style and the third one with soy beans. 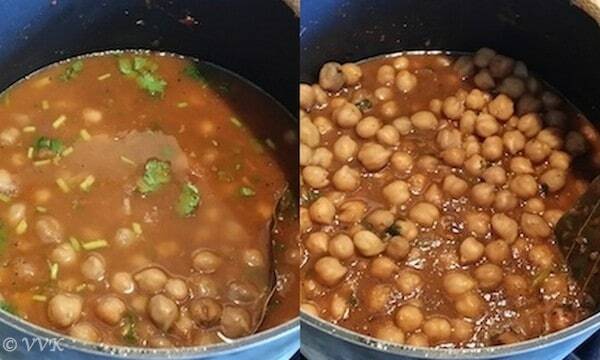 But I have never posted the traditional chole which is dark brown in color with homemade chole masala. I know this is going to be a lengthy post, so I will post my homemade chole masala powder later. 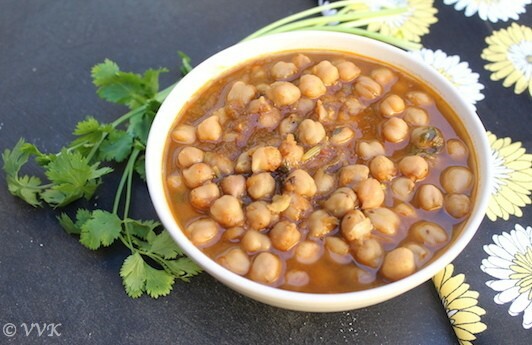 I think I will be the first one to post the chole recipe first and then the masala recipe. But again, I don’t want to bombard with two in one recipe post. 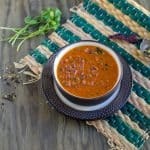 The dark color of the chole masala comes from the tea packet. Yeah, you heard it right. When you soak channa, add the tea bag or 1 tbsp. of tea powder wrapped in a thin cloth. Before cooking the beans, remove the tea bag. The color and the subtle tea flavor add magic to this recipe. If you don’t have tea sachet, in plain cloth or tissue add about 1 tbsp of tea powder and tie it tightly with a rubber band or add a knot. Soak the garbanzo beans in water along with tea sachet for minimum 5 to 8 hours or preferable overnight. 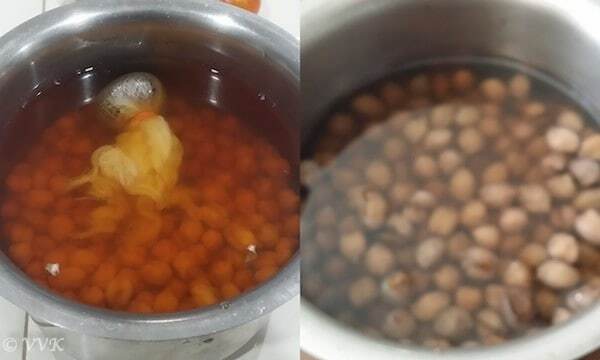 After 5 to 8 hours of soaking, remove the tea packet and pressure cook the garbanzo beans by adding 4 cups of water along with ½ tsp of sugar for up to 5 whistles. In a heavy bottomed pan, add 4 cups of water and whole tomatoes and bring it to a boil. Once the tomatoes skin starts to pull away turn the heat off. Drain the water and run it through cold water and peel the tomato skin and set aside. Heat the kadai and add 1 tsp of oil. Once the oil is hot, add the chopped onions and let cook until its turns translucent. Now blend the onions and the blanched tomatoes together. As the cumin seeds start to crackle, add the bay leaf and fry for about 10 seconds. Now add the tomato onion puree and let it cook for couple of minutes. Then add sugar, salt, chole masala and turmeric powder and mix well. Now add the cooked garbanzo beans and add required water. Check for salt and spice and adjust accordingly. Add the chopped cilantro and let it simmer for at least 20 minutes. Keep stirring the chole for every 5 minutes. That’s it. Yummy chole is ready. Garnish it with more cilantro and serve hot with your favorite bread or with samosa like below. Take two samosas in serving plate. Crush them or chop them into small pieces. Now add about 1 cup of chole masala on top. Make sure the samosa pieces are completed soaked under the chole masala. Then sprinkle some chopped onions, cilantro and pomegranate seeds and drizzle the sweet and green chutney. Cooking the onion and blanching the tomatoes can be done in microwave too. As I don’t prefer to cook onions and garlic in MW, I always opt for stove top sautéing. I didn’t add any other spice like garam masala or chilli powder in my chole. 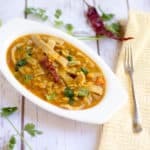 Instead of 2 tbsps of chole masala, you can include 1 tbsp of chole masala, ½ tsp of Garam masala and ½ tsp of red chili powder or 1 green chilly chopped. Tomatoes can be skipped and instead about ½ to ¾ tsp of amchur powder can be added for the tangy taste. For the samosa chole chaat, adjust the toppings as per your preference. Sev can be used too as a topping. 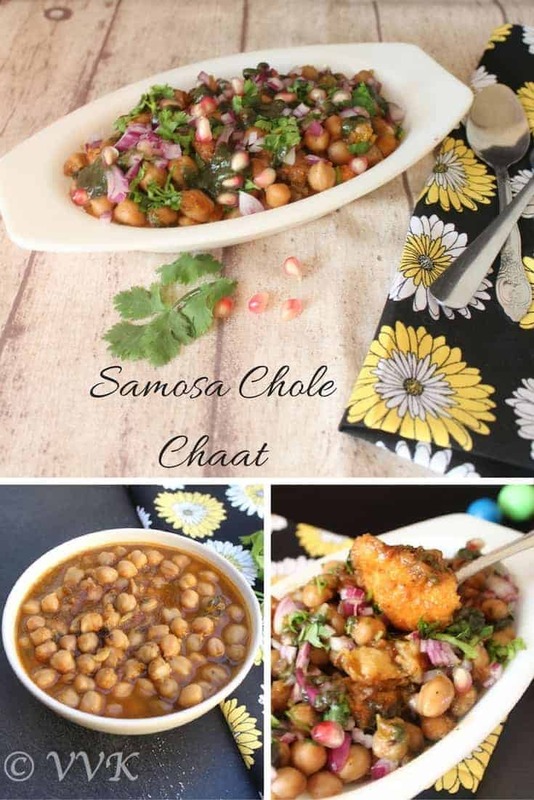 Samosa chole chaat - popular street food recipe where samosa are served with spicy and tangy chole with green and sweet chutney drizzled on top. That’s it. Yummy samosa chole chaat is ready to dig in. Oh my goodness this is also my favorite yaar..I do remember enjoying reading your list, but nothing compares to seeing it all together! I think most of my comments here have been awesome or mouthwatering or the like. But then there not much you can say when you are trying to stop drooling. Oh yeah very true. Its a meal in itself. I love samosa chole chaat. Looks so scrumptious. Yup.. same here. Thanks Harini. Same here.. Love this to the core. Thanks Suma. Thats chaat is seriously something i would like to indulge rite now, very tempting, seriously my mouth is watering here. I like this chole which can be served in many ways. Samosa chole chaat is yum!! 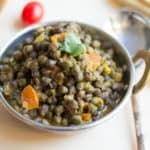 Oh wow..samosa chole ..my mouth is watering..love it anytime..I love to add some beaten curd and some garlic chutney too…oh man !..I feel like grabbing that bowl. 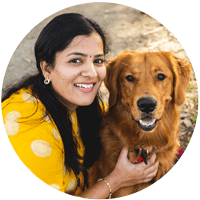 You made chole masala at home? 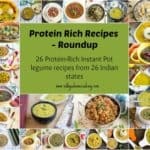 That masala looks so yum with samosas. Will wait for your version of the spice powder..
Will be posting next week Gayathri.. Thanks. 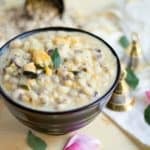 Ippadiyella tempt panna koodadhu vidhya :((( !! Aren’t I craving for that bowl right now ?? After ragda patties, this is my 2nd fav chaat ? ?